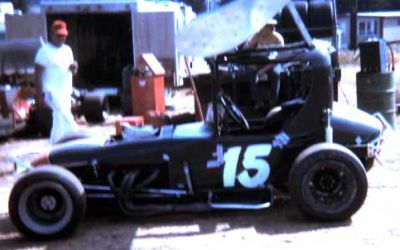 This was Rick Greves modifide till they changed the rules at Elma in 1976 for sprint cars, then Steve Parker took the car & made it street legal & it was first licensed in 1982. 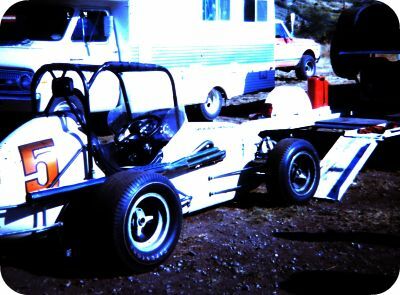 I now have the car & I have brought to what it looks like today, I still have lot's of work to do on the car & I keep changing it to meet the functions it has to preform. 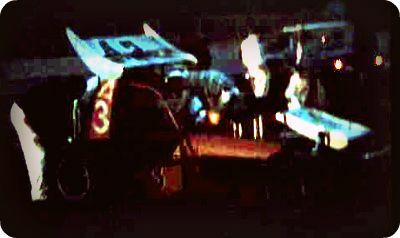 This is Rick's car as it looked in 2008 pushing off Monte Zema JR. at the RPM Race 09-20-2008. My name is Toby & I have the car now. 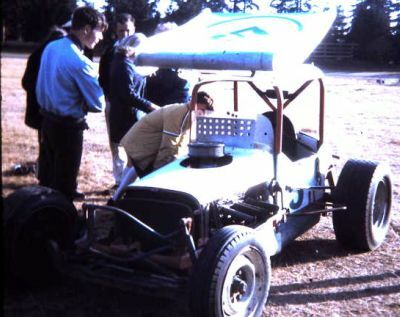 It still has the original 292ci engine, Ed Kvistad built the chassis, with a Don Edmonds Body, it blends in well in I-5 traffic. 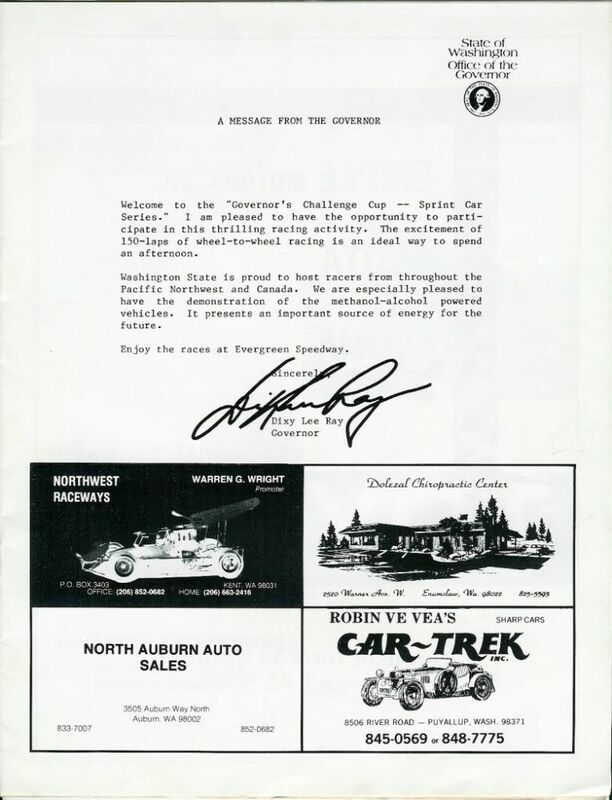 Found this and a few other shots on jimmie's old time racing forum. Photo by Robert G. Hunter. Another from the same source and same photographer. 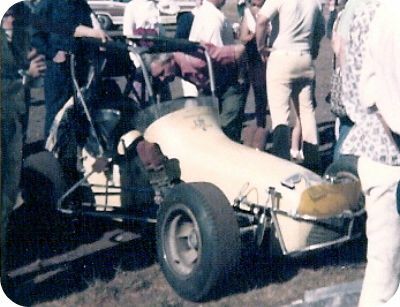 Midget great Ken Peterson after running his midget against the modifieds and sprints in a 1970 open comp race on the Elma 1/2 mile. 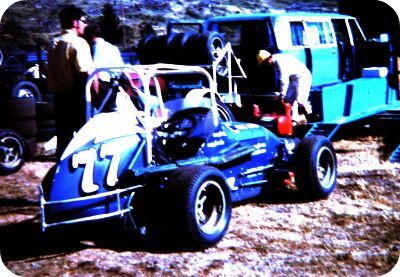 Taken at Wenatchee in 1970. No information on who the driver was or where the car was from. 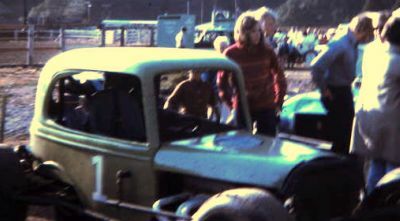 Dean Clark at Elma in 1973. 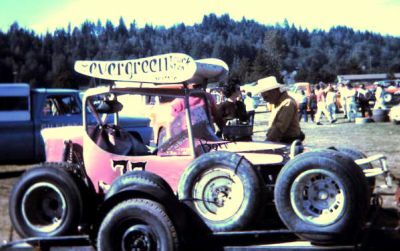 1972 shot of George Robertson, who recently passed away. 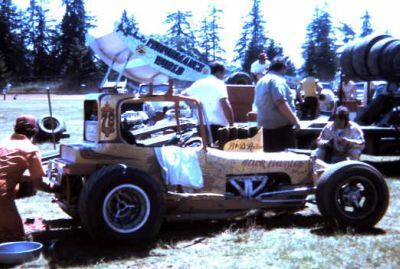 Wasn't the 1973 IDC at Tenino the race that the cage collapsed? The first run of the B dash the car had a fuel leak and sprayed down the other cars. someone protested so they re-ran the dash. Yarmie got upside down in between turn 3-4 and the cage bent flat. Every time I see a hard flip I remember this one, scarry. 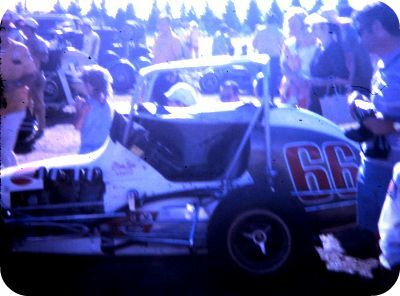 doublediamond wrote: Wasn't the 1973 IDC at Tenino the race that the cage collapsed? The first run of the B dash the car had a fuel leak and sprayed down the other cars. someone protested so they re-ran the dash. Yarmie got upside down in between turn 3-4 and the cage bent flat. Seems like they took the car to Levi Jones' shop after the wreck and put on a new cage (with rear supports this time) and were back out the next weekend to finish the series out. Thanks Rick L for posting some of your photos and I hope you continue to do so. I had a couple of requests from the WARPA meeting to continue with posting the yearbook that I started a month or so ago....so I came home and scanned the other 45 pages....only to find out after I was finished that the scanner hadn't saved a single page to a file....grrrr...lol. Shame on me for not periodically checking. Anyway......I will get back at it and try once again here soon. Also thanks to RickT for adding the 80's to this forum. 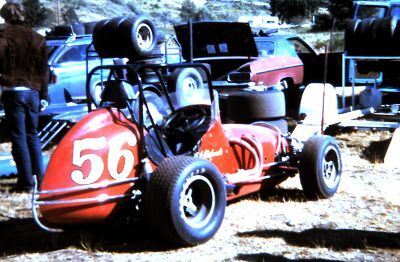 I have quite a few photos from that era that I can share....many I already have scanned. I will get to those when I finally finish with the yearbook. no problem Curt.. We will be waiting patiently for the pics. They are very much anticipated and appreciated. 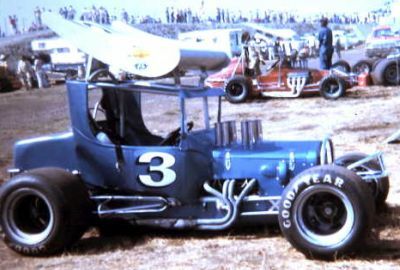 Billy Vukovich III in Vern & Carol Reitz's Spirit of Madera. Rex Beach and his hemi powered offset. 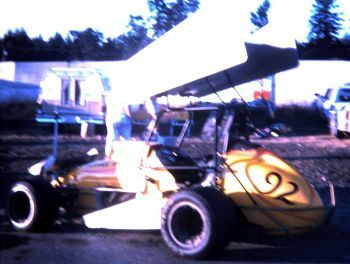 John McLaren from Texas at Evergreen during a USAC National in either '85 or '86. timbo........look on the 4th page of this thread.....towards the bottom of the page. It may be the car you are talking about. 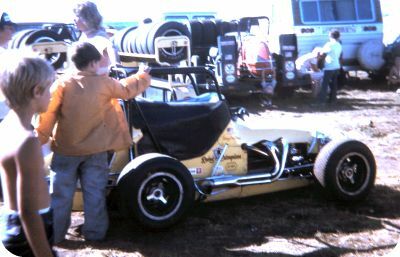 Also didn't recognize the young boy in the yellow 6w car. 6w was a Rebel Sr # for many years though. Just got a copy of a 63-64 Sky Valley yearbook. If the copy scans ok I will be pretty busy this winter....lol. 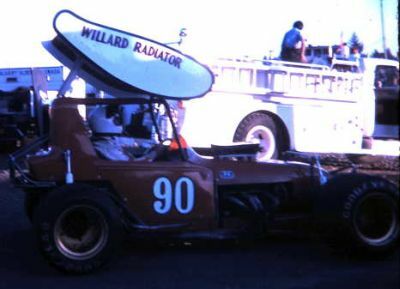 Dad had a car alot like the Steve Parker modified from the late 70's, but i think he said he sold it too Dale Underwood and he crashed it. 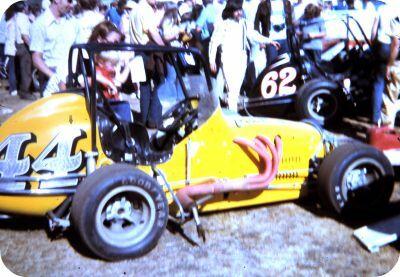 yes I remember that Rollie had a big fan base.....and was a good racer. I don't remember the incident you are talking about at the fairgrounds. But I never went to that track and it was more than likely before internet. I read Racing Wheels faithfully but I just don't remember. Ya picked a good number to run on the super. Hope to see you and Tony this year at a race or 2. Haven't come across any of the roadster, but here is one of his 1970 ride. 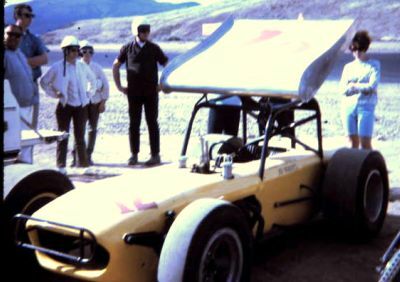 Rollie Lielke and Don Edwards were a great team and were always fun to race with. 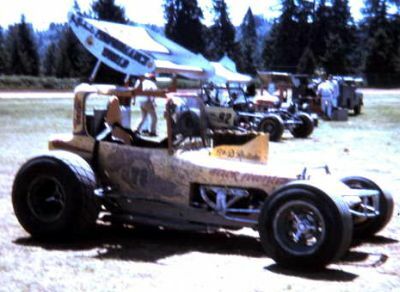 Rollie is one of the select few who were victorious at Skagit, Sky Valley, and Elma and was a track champion at Sky Valley and Elma. 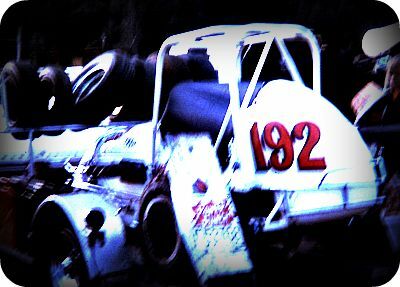 The fair race accident that Al mentioned was a bad deal. 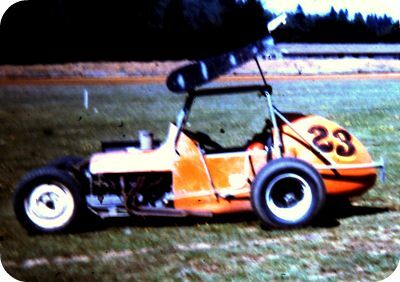 Elma was running non wing that year and Rollie was running Greg Barnheart's car at Elma and Don's roadster at the other tracks. 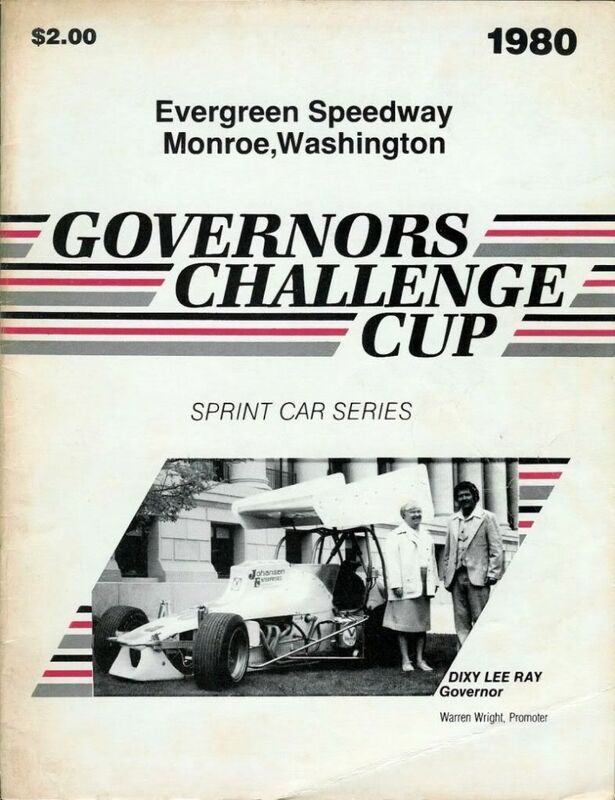 They had problems early and weren't going to be able to run, so Gary Clark out of the Portland area offered Rollie his car. 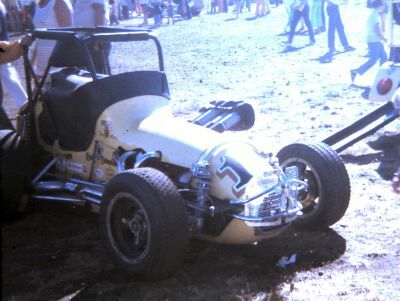 Going down the backstretch in the main, a heim broke on a front radius rod, sending Rollie off the track. People were standing (much too close to the track) along the access road watching the race and Rollie with no steering control hit and fatally injured a teenage boy. Though the accident was no fault of Rollie's and there was nothing he could have done about it, Rollie seemed to be greatly affected. 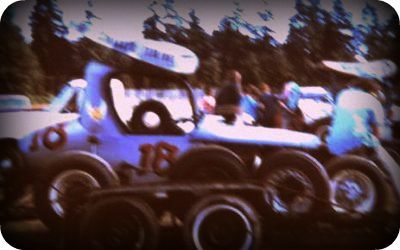 He continued to race and win for a couple more years, but it just seemed a lot of the "racing fun" was gone for Rollie. 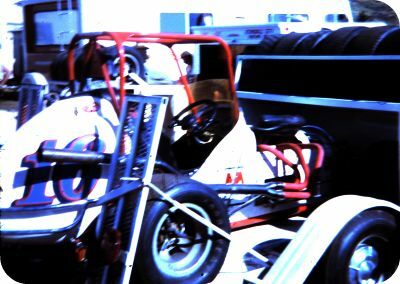 If you haven't seen it already, here is a link to several photos taken by Harold Beitler in the 70s. The second one is Rollie in the roadster. 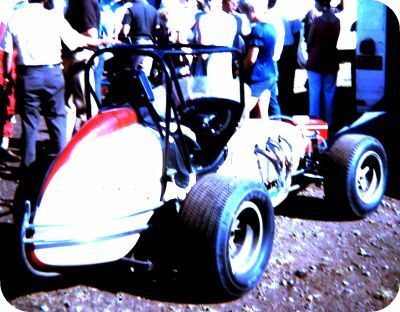 Here is another page of Harold Beitler Photos. 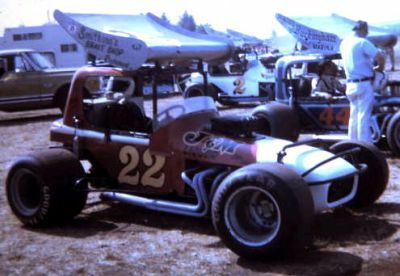 1973 USAC National Midgets at Olympia-Tenino Speedway.